Born on this date in 1974, Martin Gerber played three seasons for SC Langnau Tigers of the Swiss League from 1998-99 to 2000-01. During this time he also made his debut for Switzerland at the 2000 World Championships in St. Petersburg, Russia. Following the 2000-01 season, Gerber was drafted in the eighth round by the Mighty Ducks of Anaheim and subsequently played for Farjestads BK in the Swedish Elitserien, where he would lead them to the regular season and playoff championships. 2002 would also see him play for Switzerland at both the 2002 Olympics in Salt Lake City and again at the World Championships in Sweden. The following season he would migrate to North America and being his NHL career, first with the Mighty Ducks of Anaheim for the 2002-03 and 2003-04 seasons. Switzerland would call on him again for the 2004 World Championships in the Czech Republic before a busy 2004-05 campaign would see him return to Europe where he split his time between previous clubs SC Langnau Tigers in Switzerland and then Färjestads BK in Sweden followed by a successful Olympic Qualifying tournament and the 2005 World Championships for Switzerland held in Austria. With the resumption of play in the NHL in 2005-06 Gerber would now tend goal for the Carolina Hurricanes who obtained him in a trade with the Mighty Ducks. Gerber would post a 38-14-6 record with the Hurricanes, but would be replaced by his regular season backup Cam Ward in the first round of the playoffs, who would lead the Hurricanes to the Stanley Cup, making Gerber only the second Swiss player to have his name engraved on the Stanley Cup after David Aebischer in 2001 with the Colorado Avalanche. Gerber and Aebischer would also share the goaltending duties for Switzerland at the 2006 Olympics in Torino, Italy, where Switzerland would post memorable wins against the Czech Republic by a 3-2 score, followed by a stunning 2-0 win over Canada two days later with Gerber making 49 saves for the shutout for perhaps the greatest 48 hours in Swiss hockey history. 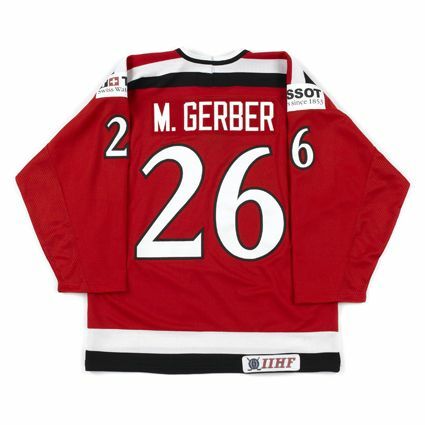 Gerber would sign as a free agent with the Ottawa Senators, where he would play the next two seasons, 2006-07 and 2007-08, going 45-27-7 and making another appearance for Switzerland at the 2008 World Championships in Canada. He would start the 2008-09 season with Ottawa and then move to the Toronto Maple Leafs after being claimed on waivers followed by his seventh trip to the 2009 World Championships, this time hosted by Switzerland. For the 2009-10 season, Gerber signed with Atlant Moscow of the Kontinental Hockey League, where he went 15-6-6. He would also help Switzerland to a fine 5th place finish at the 2010 World Championships, his best career result to date at the Worlds. 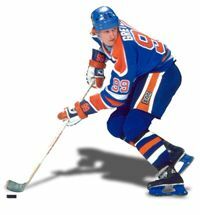 It was back to North America for the 2010-11 season, playing 42 games for the Oklahoma City Barons of the AHL as well as 3 games with their parent club, the Edmonton Oilers for his most recent NHL appearances. Gerber returned to Sweden for two seasons, beginning by spending 2011-12 with the Vaxjo Lakers before moving to Rogle BK for the 2012-13 season. Following the conclusion of the Swedish regular season, Gerber once again joined the Switzerland National Team for his ninth World Championships. Switzerland was placed in Group S, the "S" standing for Stockholm, as the tournament location was shared with Helsinki, Finland. Switzerland shocked the hosts by defeating Sweden 3-2 in their opening night game. They next raised eyebrows by defeating Canada 3-2 in a shootout, with Gerber stopping 7 of 8 Canadian attempts. Next to fall was the Czech Republic, who they put away with 3 third period goals on their way to a 5-2 win. Now through the toughest part of their schedule and full of confidence, the Swiss rolled through Slovenia 7-1, Denmark 4-1, Norway 3-1 and Belarus 4-1 to win the group undefeated with 6 wins and an overtime win for 20 points, two ahead of the Canadians. In the playoff round, they again faced the Czech Republic, coming out on top 2-1. They advanced to play the United States, easily defeating the Americans 3-0 to guarantee themselves a medal and advance to the championship final. There, they met Sweden, who they had defeated in their opening game, but, playing again in Stockholm, the Swiss fell 5-1 in the final but earned a terrific silver medal for Switzerland and Gerber, who went 4-2 in the tournament with a 1.81 goals against average and a 92% save percentage. It was the best Swiss result at the World Championships since their only other previous silver medal back in 1935, a span of 78 years and their first medal of any kind in 60 years! Gerber then returned to his native Switzerland for the first time since 2004-05 when he signed with the Kloten Flyers of the Swiss National League A, posting winning records for each of his first two seasons with the Flyers. 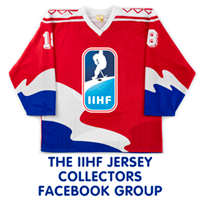 Today's featured jersey is a 2004 Switzerland National Team Martin Gerber jersey as worn in the 2004 World Championships held in the Czech Republic. 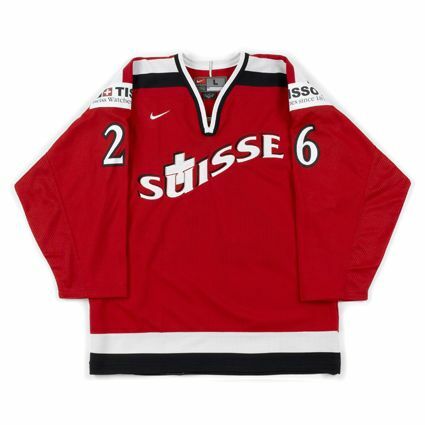 This jersey features custom made Tissot sponsorship patches on the shoulders, as well as the International Ice Hockey Federation patch on the lower back. 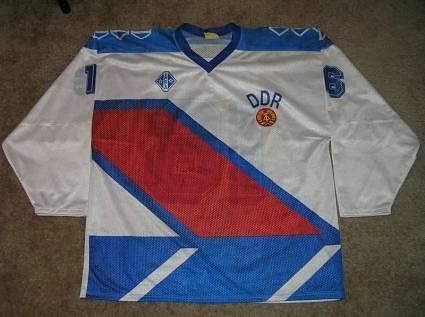 This jersey style arrived back in 1998 and remained in use through the 2004 World Championships. Our first video highlight is a player profile on Martin Gerber from his time with the Carolina Hurricanes. Here is Gerber making an astounding, if not controversial, save against Rick Nash of Canada during his shutout of the Canadians during the 2006 Olympics. This next highlight is Switzerland's second goal of the game against Canada by Paul DiPietro. And finally, the last minute of the game as the Swiss players celebrate their upset victory. After playing for the Montreal Nationals in 1903 and 1904 as an amateur, Didier Pitre turned professional with the Michigan Soo Indians (also known as the American Soo Indians in deference to the club in the same league based in Sault Ste. Marie, Ontario) of the International Professional Hockey League, the first professional league in North America for the 1904-05 season, scoring 11 goals in 13 games. The following season of 1905-06 Pitre destroyed all that came before him, leading the league with 41 goals in 22 games. His final season with the Soo Indians saw him average over a goal per game with 25 in 23 games as well as being credited with 11 assists for 36 points in 1906-07. 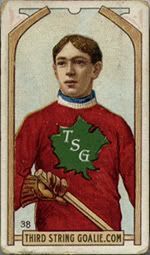 Following the demise of the three season old IPHL, and with professional teams now having been formed back east in Canada, Pitre, born on this date in 1883, returned to familiar territory in Quebec when he signed with the Montreal Shamrocks of the Eastern Canada Hockey Association for the 1907-08 season. He would find the going tougher, being limited to 3 goals in 10 games. 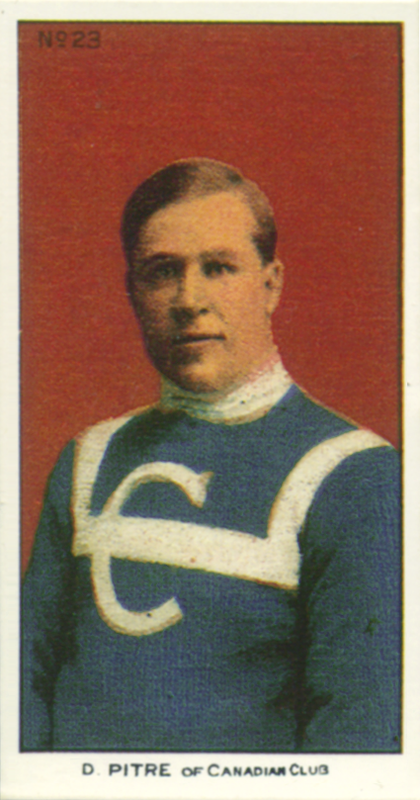 For the 1908-09 season, he saw action in 5 games with the Edmonton Eskimos, 3 in the regular season and 2 during their unsuccessful Stanley Cup challenge against the Ottawa Senators. He was then signed by the Renfrew Creamery Kings of the Federal Hockey League, scoring 5 goals in 5 games. His season wasn't quite over yet, as he added an exhibition game with his first club, the Montreal Nationals, to his schedule and impressed with four goals. He next joined the first year Montreal Canadiens of the National Hockey Association, scoring 11 goals in 12 games. Les Canadiens found the going rough, finishing in last place with a 2-10 record. Pitre continued to play for the Canadiens for three more seasons, increasing his goal total to 19 in 16 games in 1910-11, tied for the team lead with teammate Newsy Lalonde and sixth in the NHA. For the 1911-12 season, Pitre was runner up in the NHA scoring race with 27 goals in 18 games. His final season with the Canadiens saw him again finish sixth in league scoring with 24 goals in 17 games, just one back of Lalonde for the team lead. 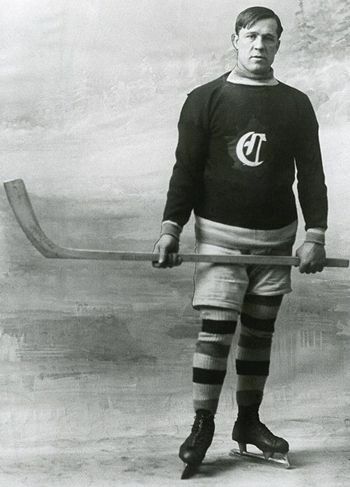 For the 1913-14 season, Pitre was lured west by Frank Patrick to be a part of his Vancouver Millionaires club in the Pacific Coast Hockey Association. Pitre's 14 goals and 16 points put him in the top ten in the PCHA scoring. After one season our wast, Pitre returned to the Montreal Canadiens and immediately set a career high in goal scoring with 30 goals in 20 games, again finishing second in league scoring with 34 points. On top of his game, Pitre immediately followed that with a career best 39 points in 24 games from 24 goals and 15 assists to win the NHA scoring championship for the 1915-16 season as the former doormats won the O'Brien Cup as NHA champions with a 16-7-1 record. The Canadiens then hosted the Portland Rosebuds of the PCHA for the rights to the Stanley Cup. Montreal would win the first Stanley Cup in franchise history 3 games to 2, with Pitre scoring a hat trick in Montreal's 6-3 win in Game 3 on his way to leading the playoffs in goal scoring. Pitre played not only center, but also spent time at the rover position for the Canadiens. Pitre was second on Montreal in scoring behind Lalonde for 1916-17, but still scored more than a goal per game with 21 goals in 20 games plus 6 additional assists. His 27 points were sixth in the NHA. Montreal won the first half of the season with a 7-3 record, but the outbreak of World War I reeked havoc with the league and the 228th Battalion club no longer had time for hockey and the other Toronto franchise was suspended by the league in a dispute with their difficult owner Eddie Livingstone, who the other owners wanted to be rid of. Montreal won the two-game, total-goals playoff series with Ottawa 7-6 to advance to the Stanley Cup playoffs against the Seattle Metropolitans, who won the cup three games to one. In a further effort to rid themselves of Livingstone, the other four NHA team owners disbanded the NHA and reformed a week later as the new National Hockey League. Pitre was again the second leading scorer on the club behind Lalonde, this time with 17 goals and 23 points in 20 games. For the 1918-19 season, Pitre finished third on the Canadiens in scoring behind the league leader Lalonde and Odie Cleghorn but was fifth in the NHL with 14 goals and 19 points in 17 games. Montreal won the NHL playoffs 4 games to 1 over the Senators to advance to the ill-fated Stanley Cup Finals, which was played in Seattle. 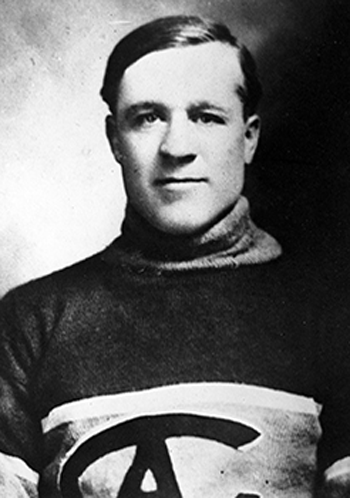 The series was tied at 2-2-1 when the Spanish Flu Epidemic forced the cancellation of the series, costing Pitre's Montreal teammate "Bad" Joe Hall his life four days later. 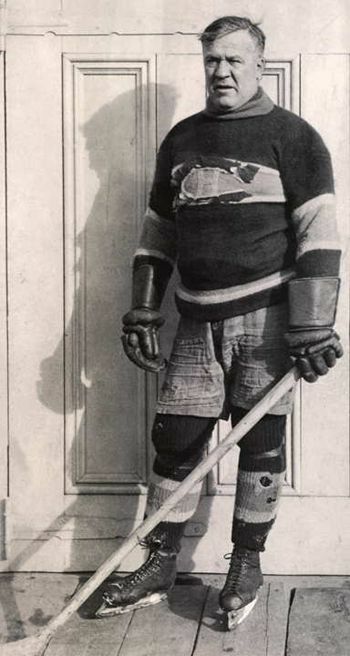 Pitre, known for his size, speed and his hard shot, retained his place in the league's top ten in scoring in 1919-20 with 14 goals and 26 points but fell just shy in 1920-21 with 25 points, one point behind the 26 points needed to keep his streak alive. The Canadiens were so deep at forward by this stage that during his final two seasons in the NHL, Pitre was moved to defense at age 38, in part thanks to his experience playing rover and taking the place on the blueline formerly occupied by Hall. This change led to him scoring only 2 goals and 6 points in 1921-22 and 1 goal and 3 points in 1922-23. Pitre's final NHA, PCHA and NHL totals were 234 goals and 61 assists for 295 points in 270 games played and he was inducted into the Hockey Hall of Fame in 1963. Today's featured jersey is a 1909-10 Montreal Canadiens Didier Pitre jersey. 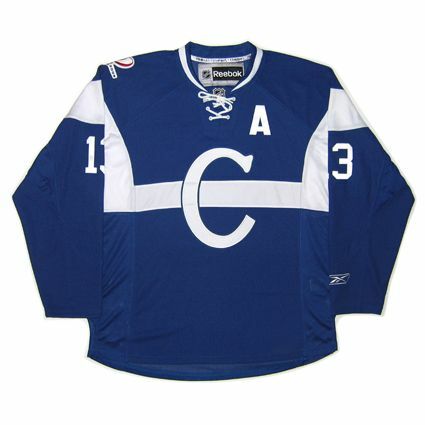 This blue jersey with a white horizontal chest stripe and large "C" on the chest was worn by Les Canadiens during their first ever season while members of the NHA. This jersey style lasted only a single season, as was the norm for the Canadiens during their formative years. In their first 16 seasons, Montreal would use 11 different jersey styles, including five in their first four seasons, in stark contrast to their tradition of keeping their same iconic style with only minor detail alterations since 1925. 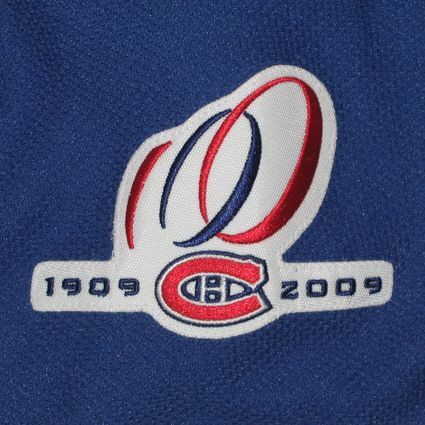 Bonus Jersey: The Canadiens revived their original 1909-10 jerseys as part of their centennial celebrations during the 2008-09 and 2009-10 seasons. This was one of six different styles worn as part of the centennial jersey program. This particular style was worn on November 21, 2009 in a 3-2 shootout loss to the Detroit Red Wings. 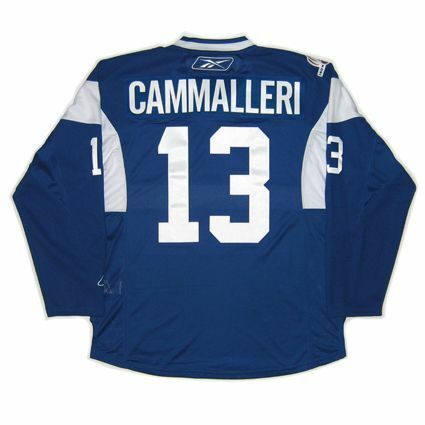 Mike Cammalleri scored both Canadiens goals during the game. 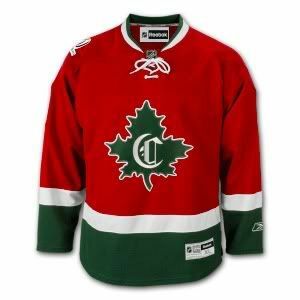 This jersey was scheduled to be worn one additional time on February 13, 2010, but the centennial jersey program was discontinued by the Canadiens new ownership with two games left on the schedule, with the other being on January 23, 2010 when their red and green 1910-11 jerseys were to have been worn, making these two styles the only ones to have been worn just once. Our video selection today takes a look back at the formation of Les Canadiens in 1909. While the 2018 Winter Olympics in Pyeongchang, South Korea are still 17 months away, the competition has already begun to secure one of three available places in the tournament. 33 teams applied for the 12 spots in the Olympics, with 9 of those places already being guaranteed to the nations ranked 1-8 in the IIHF World Rankings following the 2015 World Championships back in May of 2015 plus, somewhat controversially, the host nation South Korea, who are currently 23rd in the World Rankings. After some debate, the IIHF granted the hosts a guaranteed place in the tournament in a two-pronged effort to use the South Korean participation in the Olympics as a catalyst to improve their hockey program as well as sell a few more tickets to the games involving the home team. Surprisingly enough, the Olympic Preliminary Qualification phase, for the Olympics to be held in February 2018, began back in October of 2015 with a playoff game to determine which nation would join the full four team Group K. In that playoff game, the hosts Bulgaria defeated the nation of Georgia 9-1 to advance to Group K play, which took place in early November, 2015. Host Estonia (currently ranked 29th), Mexico (32nd), Israel (33rd) and Bulgaria (39th) participated in a round robin schedule to determine which of the four teams would advance to play in Group H in the Olympic Preliminary Round 1 phase. Estonia demolished the competition with a 19-1 win over Israel, a 26-0 blowout of Bulgaria and secured their place in the next round with a decisive 13-3 win over Mexico to make their final total 58 goals for and 4 against. Meanwhile, Group L of the Preliminary Round 1 stage took place in Spain and consisted of Serbia (30th), Spain (31st), Iceland (35th) and China (38th). Serbia needed a shootout to beat Iceland 5-4 in their first game, while Spain beat China 10-1 to take an early lead in the standings. Spain maintained it's one point advantage when they defeated Iceland 5-3 after Serbia beat China 5-1, setting up the final decisive contest. Serbia prevailed with a 5-3 over the Spaniards to win the Group 8 points to 6 and advance to the Preliminary Round 2 Group G.
Marko Milovanovic does it all for Serbia, having scored the game winning goal against Spain with 2:34 left in a 3-3 game as well as not only serving as the Serbian team captain, but his also the president of the Serbian Ice Hockey Federation as well! The Olympic Preliminary Round 2 games took place in February of 2016, beginning with Group G in Italy. There, Italy (18th), Great Britain (24th), the Netherlands (25th) and Group L winners Serbia (30th) faced off, with Great Britain narrowly defeating the Netherlands 6-5 in the opening game. 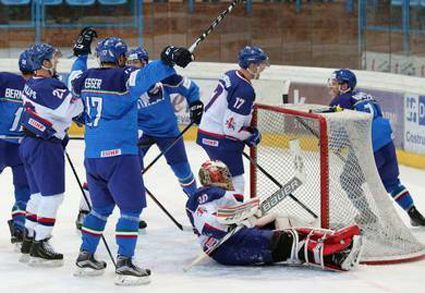 Italy took full advantage of their higher ranking and home ice to shut out Serbia 8-0. Great Britain then beat Serbia 6-2 while Italy outlasted a game Netherlands 4-2 to set up the deciding game Sunday between the British and the Italians. Italy demoralized their opponents with a 3-0 lead after the first period and cruised home to a 6-2 win to take the group and advance to the next round. Group J in Sapporo, Japan, site of the 1972 Winter Olympics, consisted of Japan (20th), Ukraine (21st), Croatia (27th) and Romania (28th). Ukraine and Japan posted matching 3-0 wins on day one over Romania and Croatia. They again both shutout their competition on the second day, Ukraine 6-0 over Croatia and Japan 7-0 over Romania, to set up their winner-take-all showdown. In a real nail-biter, the game entered the third period scoreless before Japan broke out on top with a goal at 6:19 of the third. They then extended their lead to 2-0 at 10:32 only to have Ukraine pull one back at 14:36, leaving Japan to defend their one goal advantage for the remaining 5 1/2 minutes. Former NHLer Yutaka Fukufuji was up to the task and finished with 32 saves to send Japan on to the next round. Finally, Group H in Hungary (19th) saw them host Poland (22nd), Lithuania (26th) and dominant Group K winners Estonia (29th). While the teams to advance are usually no match for those awaiting them in the higher ranked groups of the next round, Estonia's utter dominance gave one hope that they would at least be competitive in Group H.
Poland started strong with a 6-2 win over Estonia, while Hungary matched that with a 4-0 defeat of Lithuania on the first day. Both Poland and Hungary won big the next day with the Poles romping to a 9-1 win over Lithuania, while Hungary downed Estonia 7-1 to once more set up a decisive game between the group's two highest ranked teams. But first, Estonia showed they were not in over their heads by easily defeating Lithuania 4-1, becoming the first advancing team in the 2018 Olympic Qualification process to win a game. The main event between Hungary and Poland saw the Hungarians outshoot Poland 11-4 in the first period and 13-10 in the second, but the second period ended scoreless. Hungary again had the advantage in shots in the third period 10-9, but regulation ended with no score, as did the overtime, which had Hungary once more with a 4-3 advantage in shots, but they were unable to solve Przemyslaw Odrobny in goal for Poland who made 38 saves versus 26 for his Hungarian counterpart Miklos Rajna. The game and promotion to the Final Qualification round came down to a shootout. Odrobny saved the first Hungarian shot before Krzysztof Zapala scored for Poland. Both goalies traded saves in round two and when Frank Banham beat Odrobny but hit the pipe with Hungary's do-or-die third shot, Poland had scored the upset victory to win the group and advance, becoming the only team that was not a top seed to move on. The winners of Groups G, H and J will next participate the Final Olympic Qualification, which will take place starting tomorrow, September 1st, through September 4th. Things get much tougher for those teams advancing from the Pre-Qualification Round Groups G, H and J, as they are slotted into Groups D, E and F, where teams ranked 9-17 await. Group D is being hosted by Belarus (9) and will consist of last year's qualification upset underdogs Slovenia (14), Denmark (15) and Poland (22). Group E sees Latvia (10) hosting Germany (13), Austria (16) and Japan (20). Finally, Group F will take place in Norway (11) with France (12), Kazakhstan (17) and Italy (18) in what is easily "The Group of Death", as the host team in grouped with not only the team ranked directly behind them in the standings, but the highest ranked fourth seed of the three groups. Only after the conclusion of play on Sunday will the winners of those three groups gain an entry into the actual 2018 Winter Olympic hockey tournament in Pyeongchang 17 months later where Russia (2), the United States (5) and Slovakia (8) in Group B await the lowest seeded of the three qualifying teams and Sweden (3) and Finland (4) in Group C draw the first and second ranked survivors of the three stage qualification process which began way back in October, 2015 in Bulgaria. The final Olympic group, Group A, is already set, with Canada (1), the Czech Republic (6), Switzerland (7) and host South Korea (23), who the organizers already know will be the lowest seeded of the 12 Olympic participants. While little publicized and virtually unknown in North America, the Olympic qualification tournament can provide some some of the most dramatic moments, particularly in this week's Groups D, E and F with an actual berth in the Olympics on the line, as making it to the games is as good as a gold medal for the participants of the lower ranked nations and is a source of tremendous pride for all involved to compete at the highest level on sport's biggest stage against the world's best. The most memorable game in Olympic qualification history took place in January of 2005 to decide who would advance to Torino, Italy in 2006. Group B held in Riga, Latvia saw Belarus gain two points in the standings by defeating Poland, while Latvia knocked off Slovenia 2-1. Belarus took care of Slovenia the next day 7-2 while Latvia kept pace by beating Poland 3-1, setting up the final winner-take-all game against Belarus. Belarus opened the scoring of the deciding game at 5:16 of the first and stretched their lead to two at 12:06 before Latvia answered at 18:33. The second period was played even, with each team scoring one with Belarus going back up by two at 1:49 before former Boston Bruin Grigori Paneleev scored 18 seconds later to return the margin to one in favor of Belarus. Belarus put themselves in a good position to win the group and advance with a goal at 9:11 of the third to make the score 4-2 for Belarus. Now in desperation mode, Latvia pulled goalie Edgars Masalskis during a Latvian powerplay with just six minutes remaining in the game and down by 2 goals. The gamble paid off as Latvia scored at the 15:11 mark to reduce the margin again to 1. 1:47 later the Latvians thrilled the home crowd by getting the equalizer at even strength, leaving just three minutes to decide who would claim the final remaining spot in the Olympics. Alexsandrs Semjonovs then sent the home fans into rapture by finishing the comeback and punching Latvia's ticket to Italy just 33 seconds later to complete the three goal outburst in two minutes and twenty seconds in what would become known as "The Miracle in Riga", considered by some the greatest achievement in Latvian sports since they regained their independence in 1991. Last year's qualification process was also noteworthy for upsets in the form of Austria (ranked 15th in 2012) defeating 10th ranked Germany in Germany and the amazing story of Slovenia (18th) defeating not only host Denmark (12) but also Belarus (13) to make their first ever Olympic hockey tournament. 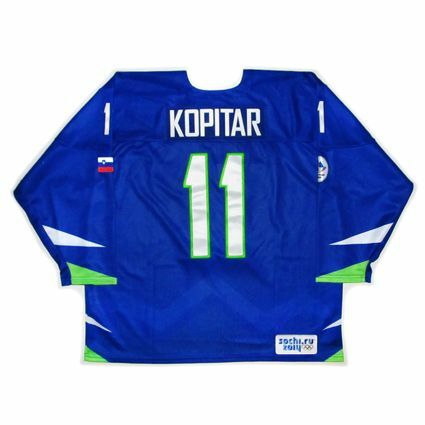 Today's featured jersey is a 2014 Slovenia National Team Anze Kopitar jersey as worn during the 2014 Olympics in Sochi, Russia. Slovenia had never qualified for the Olympics prior to 2014 and were not guaranteed a spot based on their world rankings. They were placed in Group F in the Olympic Qualifying process and won their group over Belarus, Denmark and Ukraine. Slovenia were ranked 17th in the world and it was a shock that they advanced to the Olympics despite being ranked lower than eventual non-qualifiers Germany (10th), Denmark (12), France (13), Belarus (14) and Kazakhstan (16). In Group F, they opened with a 4-2 win over Belarus before a key 2-1 win over hosts Denmark. They then dominated Ukraine 6-1 to secure their stunning, unexpected place in the Sochi Olympics. Up until the 2014 Olympic Games, Slovenia wore blue jerseys trimmed in red in the colors of the Slovenian flag. Their national football club had begun wearing green kits as far back as 1994, which are the traditional colors of the capital city of Ljubljana, which has a green dragon perched on a white castle atop green hills on its coat of arms, which is placed on a half white, half green field for the city flag. Additionally, those colors were used by NK Olimpija, the most successful club team at the time, which is based in Ljubljana. 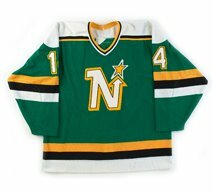 The national hockey team continued to wear blue jerseys accented with red and white through the 2013 World Championships before debuting their new blue and green jerseys for the 2014 Olympics, which caused quite a stir, as the shade of green was a very modern electric shade of green and nothing like the traditional primary colors that essentially every other nation uses. As a former member of Yugoslavia, which endured a horrible war in the aftermath of the breakup of the former communist nation, perhaps some of the motivation for Slovenia originally changing the national soccer team colors was to differentiate themselves from other former Yugoslavian members Croatia and particularly Serbia, who also wear red, white and blue colors. Today's video is the magnificent Latvian comeback that would become known as "The Miracle in Riga" which would propel them into the 2006 Winter Olympic hockey tournament. Here are highlights of the 2014 Olympic Final Qualifications from the day Slovenia defeated host Denmark to put a stranglehold on their bid to play in Sochi. The Slovenia highlights begin at the 11:22 mark. Note that Slovenia was still wearing their blue, white and red jerseys, as by the time they arrived in Sochi, they were now wearing their startling blue and neon green jerseys. On this date in 2004, the World Cup of Hockey got underway with the opening game of the tournament featuring Finland hosting the Czech Republic in front of 11,407 in Hartwall Arena in Helsinki. 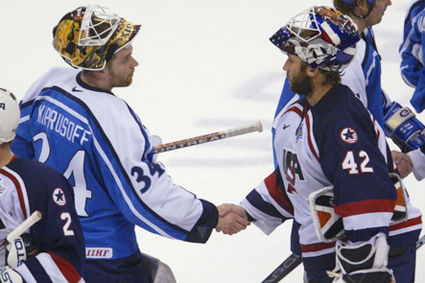 Tomas Vokoun got the start in goal for the Czechs, while the Finns countered with Miikka Kiprusoff. The first period ended with Finland on top thanks to a goal at 6:33 by Jukka Hentunen from Niko Kapanen. The second period went by with no scoring despite a power play for the Czechs and three times on the man advantage for Finland. The third period could not have begun any better for Finland, as Saku Koivu converted from Jere Lehtinen at the thirty second mark to double the Finnish lead to 2-0. With Martin Skoula off for holding at 4:09, Finland converted the power play opportunity when Kapanen scored at 4:56 from Sami Salo and Ville Peltonen to put the Finns up 3-0. The final nail in the coffin arrived at 11:09 when Mikko Eloranta beat Vokoun for a 4 goal lead with assists from Kimmo Timonen and Mikko Koivu. Kiprusoff would complete the all to easy shutout, as the Czechs only managed a mere 12 shots for the entire game, while Finland nearly tripled that with 34 against Vokoun. Finland's 13 first period shots were more than the Czechs manged for the entire game. Finland would go on to a 2-0-1 record for 5 points in the European Pool and would win the group over Sweden, who they tied at 4-4 on September 4th, thanks to a +7 goal differential versus Sweden's +4 thanks to their opening game 4 goal win over the Czechs, as Sweden would only edge the Czechs by one, 4-3, two days later. Both teams had defeated Germany by the same three goal margin. All four teams from the European Pool would advance to the Quarterfinals. Finland again defeated Germany in Helsinki, but by a much closer 2-1 score. The Czechs rebounded with a rather surprising 6-1 thrashing of Sweden in a game held in Stockholm. Finland then advanced to face the United States in St. Paul, Minnesota, where they advanced to the final after coming from behind 1-0 with 15 minutes left to play by scoring twice in the third period to win 2-1 in front of 18,064 disappointed American fans. The Czechs had a tough task, as they were paired with Canada in Toronto, but acquitted themselves well, taking the Canadians to overtime before falling 4-3. The Finns would finish as runners-up following a 3-2 loss in the final to the Canadians. 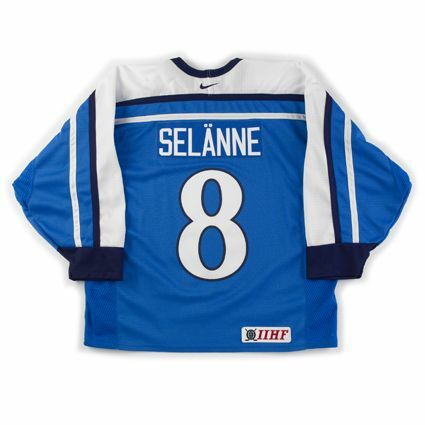 Today's featured jersey is a 2004 Finland National Team Teemu Selanne jersey. 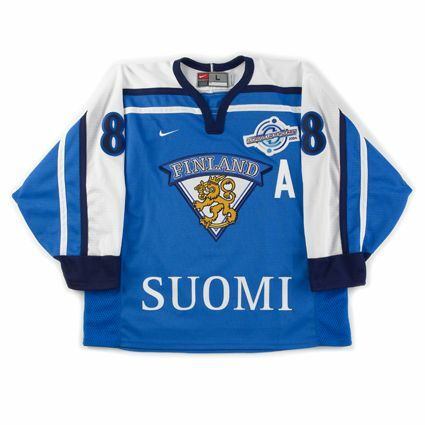 Finland first wore this style for the 1998 Oympics in Nagano, Japan with the crest reading "Suomi". 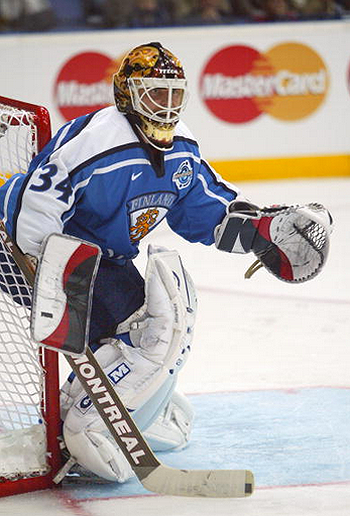 For the 2002 Olympics, the crest was altered to read "Finland" with Suomi now printed boldly across the waist. This would be the final appearance for this jersey, as Nike would introduce a new style for the 2005 World Championships. 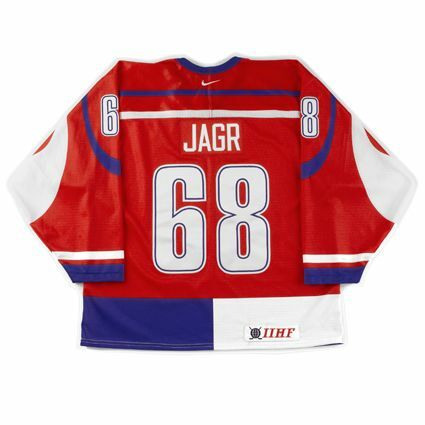 Bonus jersey: Today's bonus jersey is a 2004 Czech Repbulic National Team Jaromir Jagr jersey. 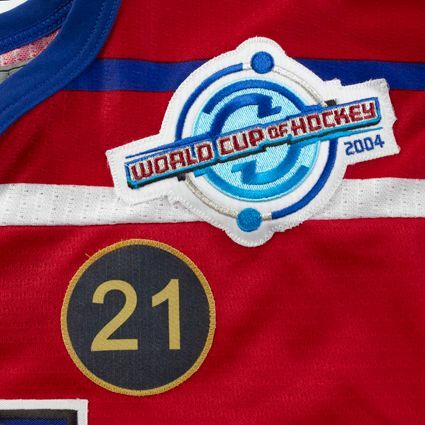 This jersey features not only the 2004 World Cup of Hockey logo patch, but also the #21 memorial patch for Ivan Hlinka, one time head coach of the Pittsburgh Penguins who was to have been the head coach for the Czechs at the 2004 World Cup, but he was killed in a car accident on August 16th, two weeks before the start of the tournament. In addition to wearing the #21 Hlinka memorial patch, Czech team captain Robert Reichel, who normally wore #21, changed to #22 for the tournament in Hlinka's honor. This striking Czech jersey arrived in 2003 and was worn through the 2005 World Championships until being replaced for the 2006 Olympic games with the arrival of the new Nike Swift jerseys. Today's video section is highlights of the opening game of the 2004 World Cup of Hockey between Finland and the Czech Republic on this date in 2004.